Traditional turkey brining requires you to submerge a whole bird in a salt-water mixture for as much as 24 hours. This means needing a large container and a lot of refrigerator space. There is an easier way. Dry brining has become a popular alternative that promises the same results without taking up as much space in your fridge. Learn the ins and outs of the dry-brining technique before smoking, roasting, or deep-frying your turkey. 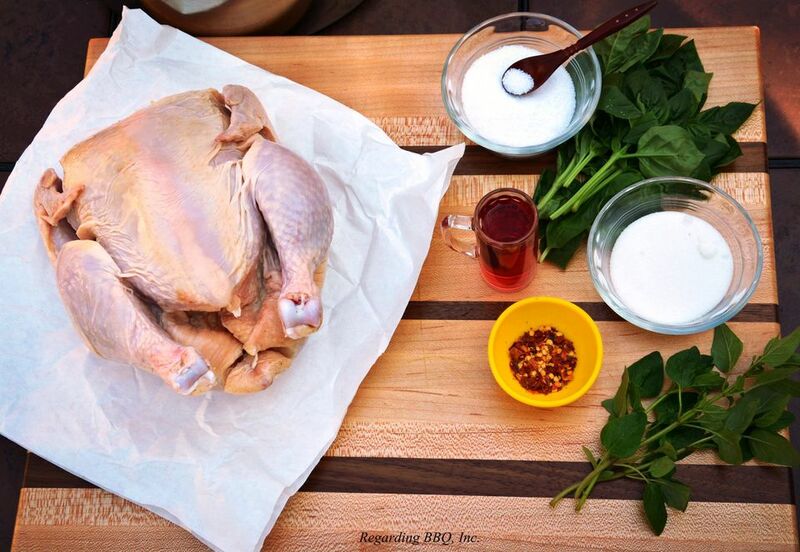 When dry brining a turkey, you apply salt directly to the meat, like using a rub. The salt draws out some of the moisture in the meat, which mixes to form a salty liquid that is absorbed back into the meat. In most ways, this works similarly to a traditional water brine, but without the extra moisture. Just like a traditional brine, dry brining can be used to add extra flavor to your turkey. By adding spices, herbs, and even citrus zest to the salt, these flavors will be drawn into the meat as it brines. The secret is, as the salt draws moisture out of the turkey it opens up the pores of the meat, allowing flavor to flow back in. The obvious advantage to dry brining is that it doesn't require the space that traditional wet brining does. You don't have to contend with dissolving salt and sugar and measuring out enough water to completely submerge a turkey. Dry brining is a simpler process that most cooks can easily utilize. Just add a salty rub and let it sit for a few days. It takes longer to effectively dry brine a turkey than the wet brining process takes. You need to draw moisture out of the bird and then let it slowly be reabsorbed. This takes about two to three hours per pound, depending on the brine instructions. An average turkey of 15 to 20 pounds will take two days to dry brine or one day to wet brine. Also, wet brining is better at introducing moisture into meat than dry brining. A traditionally brined turkey weighs about 15 percent more than it did before going into the brine. This increased weight is moisture. A dry brined turkey actually loses some of its moisture. As with any form of brining, if the turkey you have chosen is kosher or injected with a salt mixture, you do not want to brine it. This will simply make it too salty. Only brine a non-enhanced, natural turkey. Check your turkey for ingredients. If there is anything other than turkey on the list, don't brine it (and probably don't buy it). When the brining process is complete, using either wet or dry method, the turkey needs to be thoroughly rinsed to remove any excess salt from the surface. If you are on a salt-restricted diet, then it's advisable not to brine your turkey. Gravy made from the drippings of a brined turkey may have a salty flavor. Do not add any additional salt to stuffings, gravy, or any other seasonings you've already added to a brined turkey. Try to get the dry brine under the skin where possible, but it isn't necessary to pull away all of the skin to get at the meat. As the dry brine mixes with moisture from the turkey, it will work its way under the skin and throughout the bird. Place the turkey in a large, resealable bag. Brining bags and roasting bags are available in most grocery stores and work perfectly for this task. You need to be able to seal the turkey into the bag with as little air as possible. This will keep the dry brine in close contact with the meat once it has mixed with moisture from the turkey. A dry brine, like a wet one, needs a specific amount of salt for it to work. One teaspoon of table salt per 2 pounds of turkey should do the trick (or 1 teaspoon of kosher salt for 1 1/2 pounds of turkey). You can include additional herbs or spices to the dry brine, but they should not contain salt (i.e. garlic salt) and should be finely ground so that they can diffuse into the meat. Prepare the dry brine in accordance with the weight of your turkey. Apply the mixture to the turkey as evenly as possible. Make sure to get it under the skin and around the inside of the bird. Wrap the turkey tightly and seal. Place the turkey in the refrigerator for at least 2 hours per pound, but no more than 3 hours per pound. Once brined, remove the turkey from the bag, discard any juices in the bag (too salty) and thoroughly rinse the bird. Grill, ​fry,​ ​smoke, or roast your turkey as normal, remembering to add no additional salt to it in the form of seasonings, bases, or stuffings.